We at allé are incredibly fortunate to work with the greatest people in the world as our clients; so much so that I often pinch myself. They are all lovely, adventurous and all around joyful people to work with. Every single one. Not a bad apple to speak of, truly! Even among this incredible roster of clients, the Schwarcz family stands out; it feels like they were the exact people I had in mind when creating allé. Rick and Bruria are parents to Amichai (28), now married to Becca, Ariella (25), now married to Aaron, and Yardena (19). Rick and Bruria live in Michigan while the kids are sprinkled all over the country. 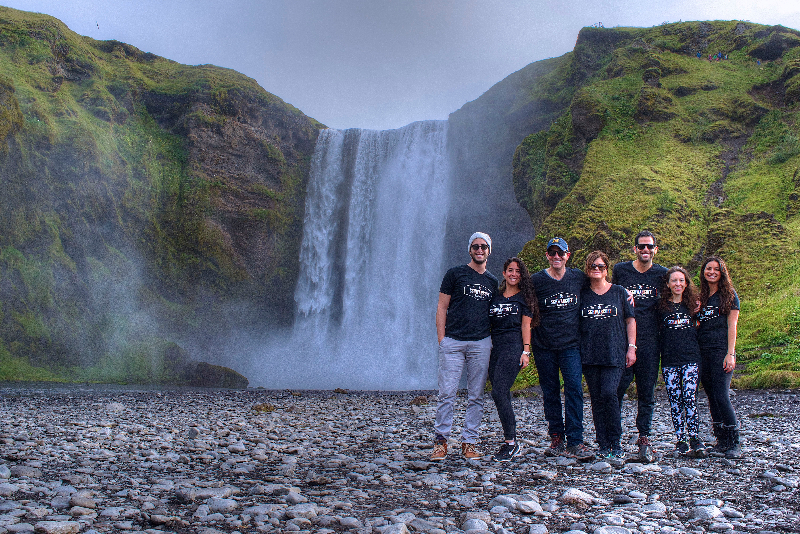 We first worked with Ariella and Aaron in planning their trip to Costa Rica, and within a few short weeks we were rolling up our sleeves to plan the family’s trip to Iceland. In between, we also planned a trip to Italy for Yardena and her three friends and another for Aaron and Ariella to Paris. One thing is for sure, if there was such a thing as being a professional of all things travel, this family would be it. I recently had a bit of a Q & A with Rick, the father and main travel guru, about the family’s past adventures and also their recent trip to Iceland, below is a “best of” from our conversation, put together from my experience of working with the family and also the scribbles in my notebook after our conversation. It goes without saying, this is a family that has seen much of the world. The Schwarczes’ past travels include the Amazon rainforest, Machu Picchu, Costa Rica, Chile, NFL games in London, Israel (many times), Egypt, Morocco and nearly all of Europe. Described in other words, Rick says when he travels, he wants to feel like he has left planet Earth, and the family’s travels as of late have been centered around this concept. I know it’s quite common in the modern American family for family vacations to be a thing that’s limited to something you do when the kids are under 15 years old. Then they hit high school age, and all of a sudden traveling with Mom and Dad is not only boring, but also embarrassing, or so I’m told. This has been brought to my attention many times, and to be honest I never really pondered it much; my family still travels together, quite a bit, and my brother and I are leaps and bounds over high school age. I just always thought my family was different (in a good way, of course). But I decided to ask Rick what his take on it was, why he thinks it is that his kids (and their spouses) so happily travel together as a family. According to Rick, the secret sauce is the memories from their past travels- they know trips together are fun, to say the least, and they have plenty of memories to prove it. They know that trips with the family don’t just mean Disneyland, boredom, or anything run of the mill. They know their Dad will keep things exhilarating and interesting. And that’s why they’re so happy and eager to go on trips together; despite it getting harder and harder to coordinate schedules. Because the Schwarczes traveled in August, we had the advantage of very long days of sunlight to work with, but admittedly, we packed their schedule very tight, knowing that this family thrives on action and activity. Some of the activities were with guides or as a part of a group, but the majority were done completely independent, with custom GPS maps that were created by the allé team. These maps included everything from gas stations to exact turn by turn, real time info for hikes that are completely off the beaten path. Because of the size of the group, it made the most sense to pick airbnb accommodations as often as possible, offering a comfortable living arrangement, instead of being split up into 4 different hotel rooms, and also was shockingly affordable, even in a pricy country like Iceland. One of my favorite things to ask clients when they come back from trips is what the highlight of their trip was, what the story they are telling all their friends about is; I want to know what the moments that took their breath away were. Rick tells me every single day had them saying “Oh my God”. When asked what the one thing that he tells people about at a dinner party is, Rick told me it was the Inside the Volcano experience, a place that is unique in this world as being the only dormant volcano in which the crater did not get closed up after eruption, instead it’s as if the magma in the chamber below disappeared completely. Following a short hike, visitors are lowered into the crater’s small opening using an open elevator system; it’s quite the venture into the center of the earth. Other major highlights on Rick’s list were also the glacier climbing/ hiking, and the hike to the Reykjadalur natural hot spring, which is literally a boiling river to soak in. While the Schwarczes were traveling, I got a very interesting phone call one morning, from Hrafn, the owner of the car rental company we arranged a car with. It turned out when filling up the tank with gas one of the mornings, in what was clearly an accident, someone (whose identity is safe with us) forgot to pay for gas. The gas station called the car rental company, threatening to call the police. So after a panicked call from Hrafn, we immediately got in touch with both Rick and the gas station clearing up the air, explaining the honest mistake, and pleading that if they wait just 2 days until the Schwarczes were back in the area they would come settle their debt. “Irina kept us out of jail” are definitely words I never thought I’d hear one of our clients say, but I vastly prefer it to “Irina had to bail us out of jail”! Before we even spoke for the first time, Rick’s daughter, Ariella, told me that in their family, Dad is always the main planner of their adventures. I wanted to make sure that Rick wouldn’t feel like we were stepping on his toes and taking over his job. So given the opportunity now, post trip, I asked Rick about this. His answer? “I didn’t lose control!” Rick went on to add that he felt completely in control, it’s just that allé did the legwork, presenting him with really interesting options that he maybe wouldn’t have uncovered otherwise (for example, the Inside the Volcano experience). When it came time for decisions, they were always discussed together. In fact, Rick says that between the customized GPS maps and concrete information in their allé travel guide, he felt even more in control of their travels and comfortable going off the beaten path than he otherwise would have felt. I find that very often when we broach the topic of budget with our clients they brush us off a bit, thinking that we probably have the same approach to budget as the contractor who built their house, or each wedding that has ever been planned. That’s not at all true for us at allé, and so I was quite proud when Rick highlighted that allé kept their family trip comfortably within budget, that we were very clear about how we were doing on budget the entire time and kept track of it all. And regarding our travel planning fees, Rick says he believes he actually saved in many ways; in fact, he believes our fees were not only reasonable, they were free, because the savings as a result of working with us easily covered the cost of the travel planning fees. He sites the times that we were able to get additional discounts for them, or get them private groups without any sort of a surcharge. Rick even reminded me that accidentally taking a taxi in the wrong direction one day can be a costly mistake, easily avoided with allé. As we were wrapping up, I asked what the effects of traveling often and much internationally has had on the kids? Rick summarized it in a few but very powerful words: “they are well rounded and they appreciate what they have”… Simply and perfectly put, it’s words like these that make us at allé love planning multigenerational, family travels.